For background on the 2004 Colton Tiger Rescue, read Ten Years Ago This Month, The Colton Tiger Story - The Largest Big Cat Rescue In U.S. History and watch 39 Tigers: The story of the largest tiger rescue in US history a documentary by William Nimmo, founder of Tigers in America. 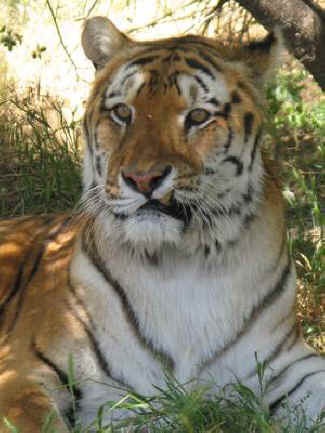 It is with heavy hearts that we share the news that two of the oldest tigers from the 2004 Colton tiger rescue have passed away. It remains the largest big cat rescue in U.S. history, with PAWS providing sanctuary for 39 tigers. Before coming to PAWS, Rex had endured years of neglect which had taken a toll on his health. It was upon his arrival at our ARK 2000 sanctuary that we discovered the true extent of his health problems. All of the rescued tigers were given a complete, nutritious diet - possibly for the first time in their lives. But Rex's emaciated body was unable to process food, and he had distressing bouts of vomiting and diarrhea. He was diagnosed with pancreatitis and inflammatory bowel disease by our veterinarian, Dr. Jackie Gai, who prescribed medications which greatly improved his quality of life. Because of his food sensitivities, he was fed a special diet of rabbit and elk meat which keepers cut up into small enough pieces that he could easily digest. Rex began to flourish with proper nutrition and medications, gaining muscle tone and a healthy, shiny coat. Rex had a relaxed and trusting personality, and was eager to "chuff" a greeting to his keepers, especially at meal time. As Rex got older, he began to experience problems with arthritis and kidney failure - both very common in older felines both domestic and exotic. Medications for these ailments were hidden in food treats daily, and kept him comfortable for several more years. Volunteers built a special resting wooden platform for Rex, which keepers covered with a plush bed of hay every day. We will always remember Rex, lounging in the sun with his tail hanging off the edge of his platform. Due to progressive kidney failure and arthritis, and in order to prevent him from suffering, the compassionate decision was made to euthanize Rex. He passed away on March 4th at the estimated age of 20 years, surrounded by the dedicated keepers who took such excellent care of him. Sunita also endured unspeakably horrible conditions in Colton. 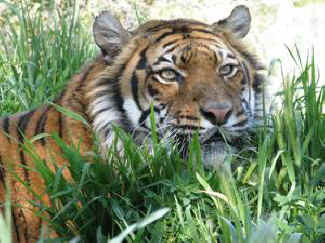 Housed with seven other tigers in a barren, dirty enclosure, she was forced to constantly compete for food and shelter. PAWS' co-founder, the late Pat Derby, always remembered the first time she saw Sunita during a visit to Colton - crouching behind a piece of metal, snarling and hissing at people passing by. Pat was moved by her fiery spirit, and couldn't wait to bring her home to ARK 2000 where she could feel safe. The polar opposite of Rex in terms of personality, Sunita was wary, tough, and fierce. She was diminutive in size, weighing only 160 pounds, but she was all muscle. When she came to ARK 2000, this little survivor finally relaxed, realizing that she no longer had to fight or struggle for her needs. Her keepers doted over her every need, building special furniture for her, including a small table that made it easier for her to eat her meals when she developed arthritis in her neck. Tiger Supervisor Renae Smith had an especially gentle and patient way with Sunita, coaxing her to take her daily medications for arthritis and epilepsy. Sunita enjoyed resting in the sunny habitat, and we will always remember her vibrant copper and black coat and beautiful golden eyes among the tall blades of green grass. As her arthritis got worse, it became increasingly difficult for Sunita to walk, and to rise from a prone position. Again, the difficult but most compassionate decision was made to euthanize Sunita to prevent her from suffering. She was estimated to be at least 22 years old when she passed from this life on March 19th, surrounded by those who loved and admired her.